New Political Parties law will force parties to separate from their militias. Salahuddin initiates national reconciliation process. Coalition hits Manbij with seven more airstrikes, as Daesh loses further ground. 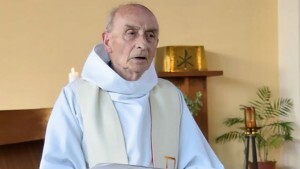 Daesh assassins kill French priest during Mass. DaeshDaily comment. We found the explanation behind this law somewhat unclear, and suspect that its implementation will be a subject of contention. However, the fairness of the governmental system has been a constant source of criticism. DaeshDaily comment. Yesterday, the BOC reported defusing a vehicle bomb in the same area. DaeshDaily comment. Daesh’s didn’t show any photos of the plane wreckage, as it has done before. For example, Daesh terrorists paraded with the dead body of the pilots of a recon plane that went down in Hawija. Most of the items shown in the photo can be bought on Amazon as was pointed out by a DaeshDaily former military officer. DaeshDaily comment. As usual, Daesh goes to the tribes when it senses troubles. DaeshDaily comment. The government is trying to expand such initiatives to other areas to start a real national reconciliation process. DaeshDaily comment. This not the first time we hear such statements. Security might not have the capacity to deal with such information and prevent the attacks. DaeshDaily comment. We get the motive, but this is exactly what Daesh wants; long lasting societal wounds. And where will the excluded people go, and who will pay them a salary? DaeshDaily comment. For Daesh, not obeying its orders or opposing it makes you a non-Muslim automatically. VetoGate reported yesterday that three civilians were wounded when an IED exploded near Al-Wadi Bridge in Arish. DaeshDaily comment. The sheer depravity of Daesh is apparent from this truly horrible incident. Despite their religious pretensions, they are people of sub-human values focused only on power and the joy of killing others in cruel ways. Incidents like this put their supposed religious ideology in perspective. The worst thing we can do is to believe Daesh media, to see the terrorists as religious fighters with a mission, albeit misguided, to change the world. Daesh terrorists are often sociopaths and psychopaths, and the people behind them are murderous criminals who will kill anyone to remain politically relevant. Unfortunately this is not clearly communicated in the media, even in the West. Daesh is trying to show that beheading an 84-year-old man is a victory, that killing unaware civilians in a mall or a club is a holy fight, that blowing up women and children in suicide attacks will take the terrorists to heaven. For Daesh’s online fanboys these are acts of bravery. That shows us that Daesh is not a group of normal people but a bunch of criminals who must be dealt with as such. There was an explosion of anger from Muslims on social media over Daesh’s beheading of a French priest (reported above) in his church. One theme was that this had no conceivable religious purpose. DaeshDaily comment. This is an example of how the Daesh incubator media justifies its existence. We just want to understand what kind of “oppression” makes Saudis from well-off families detonate themselves among civilians in Iraq?